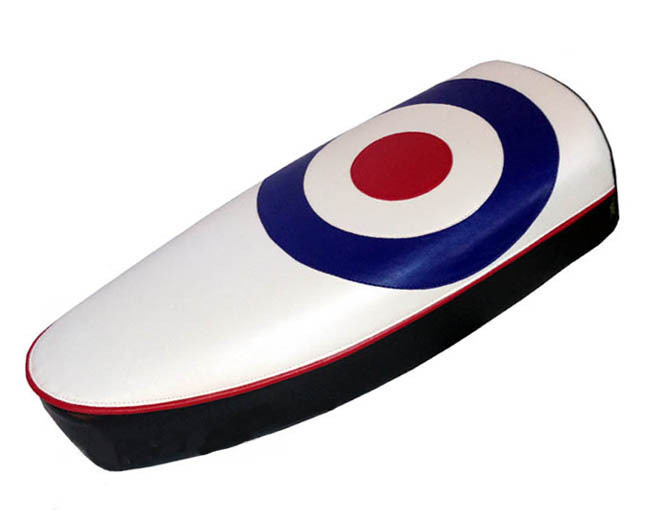 We think you will love our modern take on a scooter classic, the Mod Target. Very few symbols represent the Mod and scooter culture like Great Britain's Royal Air Force roundel. This is a cool way to give your scooter some British style! Our hand tailored, fully sewn seat cover will turn heads wherever you go, and is very practical. This seat cover is waterproof, UV stabilized (will not fade,) and will keep your seat as cool as a cucumber in the summer sun. Featuring an oversized RAF roundel on a white background trimmed with red piping, we tailored this to have a vintage look and feel to it, and we finished the sides in black, to give you a nuetral border. That way, this seat cover will look amazing on any color scooter. Boom. No staples or tricky assembly required. Our impeccably tailored covers fit like garments on your seat. This is just the kind of signature accessory your Stella is calling out for.